There's nothing more satisfying than a cheesy oven-baked lasagna with crisp edges. But what is the best temperature to bake lasagna and how long should you bake lasagna for? When making lasagna, you'll pre-cook the sheets of pasta along with any meat you're using in the recipe. Make sure not to overcook the pasta — you'll want it to be just shy of al dente. Once you've pre-cooked these ingredients and layered them with the sauce, cheese and whatever else your heart desires, baking simply serves to heat the food and blend flavors (rather than cook the dish to a safe level of doneness). The baking time and temperature needed for lasagna is approximately the same no matter what the recipe's ingredients are — for example, you can add meat, spinach, mushrooms or béchamel. That being said, cooking time can vary depending on the size and material of the pan in which you're baking the lasagna and how many layers your lasagna has. If you use a 13" x 9" glass baking dish, and your lasagna has at least three layers, it will take approximately 45 minutes to cook in an oven set to 375 degrees Fahrenheit. 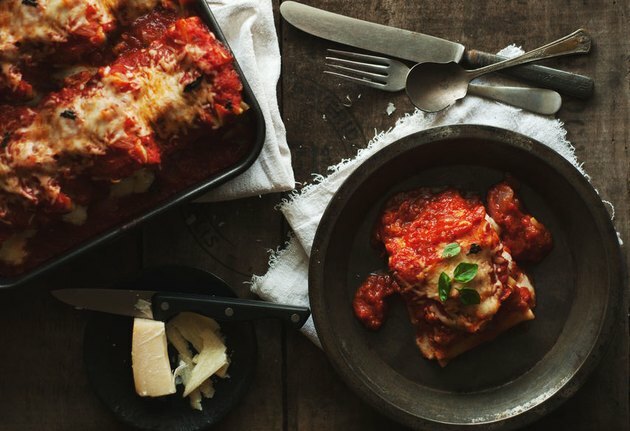 We've provided our go-to basic meat lasagna recipe and baking method below, along with healthy-ish lasagna recipes plus tips on the best way to freeze and reheat your lasagna — because when it comes to make-ahead dishes that you can eat all week, lasagna is king. Step 1: Heat 2 tablespoons olive oil in a sautee pan over medium heat. Add ground beef and sausage to the pan, season liberally and cook until well browned. Drain off the excess fat from the pan, then add in your jar of tomato sauce. Step 2: Bring a pot of salted water to a boil. Cook lasagna noodles for about 8 minutes or until al dente. Drain pasta, toss with a bit of olive oil and set aside. Step 3: Combine the ricotta with the egg in a mixing bowl. Step 5: To assemble, start by spreading 1/3 of the meat sauce in the bottom of a 13" x 9" baking dish. Top with 6 pieces of the cooked pasta, 1/3 of the ricotta mixture, 1/3 of the mozzarella slices and 1/3 of the grated parmesan. Repeat layers in this order (for a total of three layers), ending with the parmesan on top. Step 6: Cover the 13" x 9" baking dish with foil and bake the lasagna for approximately 30 minutes or until a visual inspection shows the sauce bubbling over the top layer of pasta and cheese. Covering the pan prevents the lasagna's top layer from browning too quickly while the middle is still cooking. Step 7: Remove the foil and bake the lasagna for another 10 minutes to brown the top of your lasagna. After you pull the lasagna out of the oven, let it stand for approximately 10 minutes before serving. 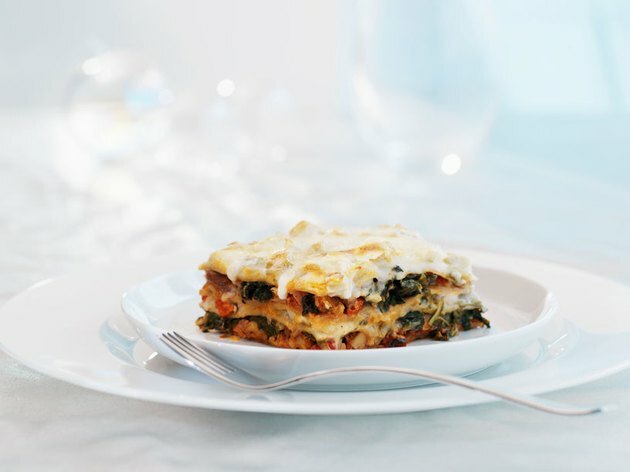 Lean Lasagna: If you want to make a lasagna that won't put you in a food coma or throw off your macros, try this Lean Lasagna Recipe featuring whole-wheat pasta nestled between layers of ground turkey, spinach, mushrooms, crushed tomatoes, low-fat mozzarella and fat-free cottage cheese. One serving of this satisfying lasagna has just 274 calories, 6 grams of fat and a whopping 26 grams of protein. Rotisserie Chicken Lasagna (Family-Style): The addition of whole-grain lasagna noodles makes this Rotisserie Chicken Lasagna rich in fiber, while the addition of chicken means each serving is packed with lean protein. One serving of this satisfying lasagna has 325 calories, 13 grams of fat and 30 grams of protein. Healthy pasta swaps: Replace the pasta sheets in your lasagna with long slices of roasted zucchini for a low-carb version. Not into zucchini? You can also replace the pasta in your lasagna with slices of blanched sweet potato or slices of roasted eggplant. If you want a pan that bakes evenly, looks good and won't break the bank, wirecutter recommends the HIC Porcelain Lasagna Pan ($50). Another classic bakeware brand is Pyrex, which sells a lasagna pan for $79. Why not freeze your leftover lasagna, or even better, make a second lasagna (in a disposable pan) to keep in the freezer for later? As long as you wrap it tight in cling wrap or foil to keep air out, you can freeze lasagna for up to one month. 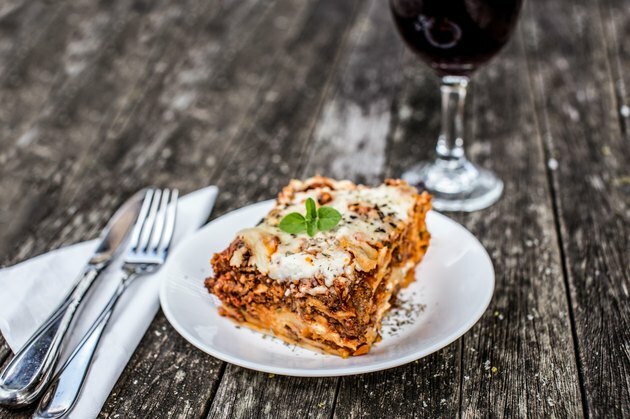 The day before you want to serve the lasagna, remove it from the freezer and place it in the refrigerator to thaw overnight. Once thawed, you can bake your lasagna using the instructions above.